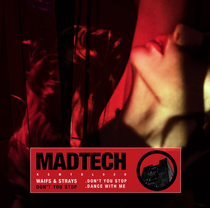 This month will see Waifs & Strays release their ‘Don’t You Stop’ EP via Kerri Chandler’s MadTech Records, a two track single from the Bristolian artists. Waifs & Strays aka Amos Nelson and Richard Beanland have a decent back catalogue, having racked up singles on imprints such as Futureboogie, Hot Creations, Leftroom and Heidi’s Jackathon Jams. Here we see the pair add another driving force onto their affiliations, joining the MadTech Records roster, and following the footsteps of Josh Butler, Redway and Mia Dora of late. Opening up the single is title cut ‘Don’t You Stop’, seeing the duo amalgamate loose, low-slung drums, bright chord sequences, wandering saw-wave bass stabs and stuttering acid hits, while a selection of vocal snippets are carefully structured to further fuel the evolving groove. The duo then offer up ‘Dance With Me’ as a B-side to close the single, again we see their signature groove-led style on offer, as they merge choppy bass hits with swinging 909 drums to lay the foundations. A low-pitched vocal uttering the track’s title and resonant synth lines are then thrown into the focal stages of the record in a subtly evolving fashion to round of the composition as a dance floor focused house number. It’s out on Beatport today, everywhere else on 27 April, check it below.